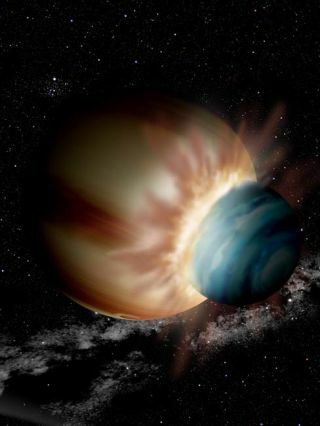 An artist's concept of the aftermath of a collision between two protoplanets, one Jupiter-sized and one Neptune-sized, in the system 2M1207. AUSTIN, Texas — An extrasolar planet about one-fourth the heft of Jupiter might have formed from the collision and merger of two planets, astronomers announced today. Known as 2M1207B, the object orbits a brown-dwarf star called 2M1207A located 170 light-years from Earth and seen in the direction of the constellation Centaurus. Astronomers have long puzzled over the mysterious object, which seems to fall outside the spectrum of physical possibility. Its temperature, age and brightness don't match up with what astrophysical theory would predict. "This is a strange enough object that it needs a strange explanation," said Eric Mamajek of the Harvard-Smithsonian Center for Astrophysics. Mamajek presented the research here at a meeting of the American Astronomical Society. Researchers have debated since 2004 what exactly the object is, however — whether it's a planet or perhaps a brown dwarf, which is a failed star and not a planet. Past estimates put the object's mass at about five times that of Jupiter. However, the new study, if accurate, suggests the object weighs less than Jupiter. If the new model is correct, it would mean 2M1207B formed in a similar fashion to a planet. It would also means that a 2004 picture of the object would go down in history as the first photo of a planet outside our solar system. This titanic-collision theory would explain why 2M1207B is a feverish 2,400 degrees Fahrenheit (1,315 degrees Celsius) even though it's had possibly 8 million years or so since formation to cool off. It should have cooled to 1,300 degrees F (704 degrees C) by now. A smashup between a Saturn-sized gas giant and a planet about three times the size of Earth could explain the extra heat. From nudges to colossal crashes, such encounters are common. "Most, if not all, planets in our solar system were hit early in their history," Mamajek said. Perhaps most notably, a collision created Earth's moon. And another knocked Uranus on its side. "It's quite likely that major collisions happen in other young planetary systems, too." In addition, 2M1207B is 10 times fainter than expected for its temperature. In 2006, astronomers suggested a dusty, edge-on disk curtained some of its light from view. Now, Mamajek and his colleague Michael Meyer of the University of Arizona propose 2M1207B is small, only about the size of Saturn, and so has less surface area radiating energy. They estimate the object has a radius of 31,000 miles (50,000 kilometers) with a mass of about 80 times that of Earth. And the only way for such a small object to remain so hot so long after its birth is if it suffered a recent, titanic collision that heated it, they say. Mamajek added, however, a planet collision may not be the correct explanation for the odd traits of 2M1207B. Still, he expects astronomers will find such examples of colliding planets by the next generation of ground-based telescopes. "Hot, post-collision planets might be a whole new class of objects we will see with the Giant Magellan Telescope," he said.